Welcome to the Buick engine light Question and Answer Page! This page should save you some time from submitting a duplicate question and having to wait for a response. We will include the model in most questions, so you can use the "Find on this page" function of your browser's "Edit" menu to get relevant info for whatever check engine light concerns you may have. For instance, just type in "Park Avenue" and search for responses relating to this vehicle. You could also type in a Buick engine light code number by itself such as "P1352" to get all related responses for this trouble code. Just keep hitting "Find next" to go through all relevant check engine light responses. We don't recommend including a model year as this may make your search too narrow, and you may miss out on some relevant posts. Our Buick engine light resources cover a very wide range of concerns, but if you can't find what you're looking for through these links or our code listings, then visit the check engine light "Get Help" link on the navigation bar. As always, all repairs should be attempted only by a qualified individual. Please read our Disclaimer before getting started. Thanks for stopping in, and we hope you have found something helpful from our site! 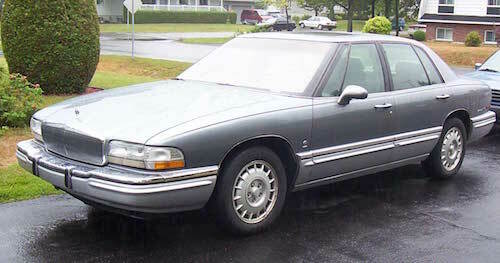 I have a 1998 Buick Park Avenue. I am getting a fault code P1352 which is apparently IC Output High/Pulse Detected when GND Cyl 2. I don't know what this means. I changed the ICM as recommended by a local mechanic. No change as fault code keeps coming up. Is this a bad ignition wire on cyl 2 or a bad spark plug? The coil is shared with another plug so it seems not the coil. Some suggest the ECU or cam position sensor. If you can lead me to a solution, I would appreciate it. Thank you. Thanks for submitting your Buick engine light question! I think I can be of assistance. Under normal operating conditions, the Ignition Control Module (ICM) sends information to the Powertrain Control Module (PCM) that it uses to control the fuel system and spark advance. The ICM normally controls spark advance on engine start up (by-pass mode), and once the PCM receives a reference signal that the engine is running, it sends 5 volts to the by-pass circuit which tells the ICM to hand over control of spark advance to the PCM. This is known as IC Mode. If the computer detects an open in the by-pass circuit, it will set the P1352 Buick engine light code. Possible causes are an open in the wiring or internal PCM or ICM concern (not as likely). Refer to our Automotive Circuit Testing article for help. Check the connectors at the ICM and PCM for loose pins or corrosion and then check the wiring for an open circuit or possible intermittent open (again, see our article on Intermittent Circuit Diagnosis in the Articles Index). The by-pass circuit should be a tan wire with a black tracer (TAN/BLK) and runs from pin 53 on the PCM to pin B on the ICM. I would also recommend checking the remaining circuits between the ICM and PCM including the 3X Reference Circuit which is PPL/WHT and runs from PCM pin 8 to ICM pin D. If all wiring tests out fine and passes intermittent testing you may have a faulty PCM, but this is unlikely. If this Buick engine light code is set, the engine will start and run but may be in by-pass mode timing. Hope this helps! Thanks and have a great day! I own a 1998 Buick LeSabre with a Buick engine light issue. For almost the past 8 months my check engine light has been on. I have checked it with my code scanner and it is a P0171 - System Lean Bank 1. I can't seem to figure it out. The car does have 164,000 miles on it and is still going strong except for the engine light and some sputtering when it's first turned on. There is also more exhaust than normal, and it seems to use a little more gas than it used to. But I must tell you that a year ago I had to replace the upper air intake gaskets because of an antifreeze leak that sucked in all the antifreeze. I also replaced the cylinder head gasket, and cleaned all the carbon off the surface of the intake and exhaust valves as well as the surrounding area from the cylinder head on the fire wall side. Unfortunately I did not do that to the cylinder head on the radiator side. A relative said that that side was not leaking antifreeze and told me that I didn't need to take it off. I thought I should have because of the fact that I had cleaned the other. About 2 months ago I got a map sensor from a junk yard because mine had broken off. I didn't realize until later that the nubers didn't match my orginal. Should I give it a really good tune up by replacing the O2 sensors, mass air flow sensor, map sensor and the plugs? About 5 months ago I had to replace the muffler. After I put the new one on I noticed a loss of power. Could this contribute to the problem? I have noticed carbon around the connections to where the muffler is attached. Please help me with this Buick engine light! Thanks for submitting your Buick engine light question. Please take a moment to refer to our article on diagnosing Oxygen Sensor Codes for an overview of how to handle these codes. From here I can offer a little more advice. Initially I would check for a vacuum leak as this is the most common of these types of codes. Next, based on the symptoms of excessive fuel consumption and running rough on cold start, I would suggest checking for a leak in the fuel system through the injectors or regulator. Understandably, you would think this should cause a rich code, but if it is causing a misfire on startup then the oxygen in the air fuel mixture is not getting burned as well, resulting in a possible lean condition. I did a quick check and it appears that there was a recall on the fuel pressure regulators on these vehicles for leakage. I recommend calling a local Buick dealer and having them check your vin number for this recall. Reference number is 04V090000. I hope this information helps you with your Buick engine light. I would also recommend having the numbers on the MAP sensor cross checked, as an incorrect sensor can cause a lean code as well. It may be a good idea to get a new sensor of the correct calibration. When replacing sensitive electronic components such as this it's sometimes difficult to geat a good used component. On the muffler issue: I would recommend checking the muffler for restrictions, since you noticed a serious loss of performance after installation. If there is carbon build up on the connections, then you likely have a leak that should be repaired. Make sure nothing got caught up in the pipe during shipment or assembly. Let me know if I can be of assistance with future Buick engine light concerns! Thanks!